Chorus pedals add a layered effect to your playing, providing a slight delay to your output, making your guitar sound like multiple guitars. It’s more than a delay pedal, though, as it combines your clean tone with a modulating signal that is speeding up and slowing down causing the doubling or tripling effect. Click Here to see Amazon’s selection of Chorus Pedals for your guitar. The Chorus effect is also used fairly heavy in worship music. The running joke is that you can play just about any song in the church, provided you run enough delay, chorus, and reverb on it. As with all of these effects pedals, there are countless options. I’ve been hanging out at the music store, listening to youtube reviews, reading reviews online and arguing with my fellow musician friends. In the next 10 minutes, I’m going to help you narrow the options down to the best chorus pedal for your type of playing. I know that we are all going to have a favorite. You cannot argue against the M234 being a solid pedal. And this one is our top pick. When it comes to subcompact units, I’ve been increasingly dissatisfied with the sound they produce. 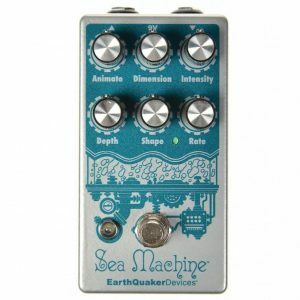 It just seems like so much has been lost through the years with each company trying to make a pedal cheaper than the next guy. And while these cheaper versions can get the job done, I just find that there is something intangible missing from their sound. 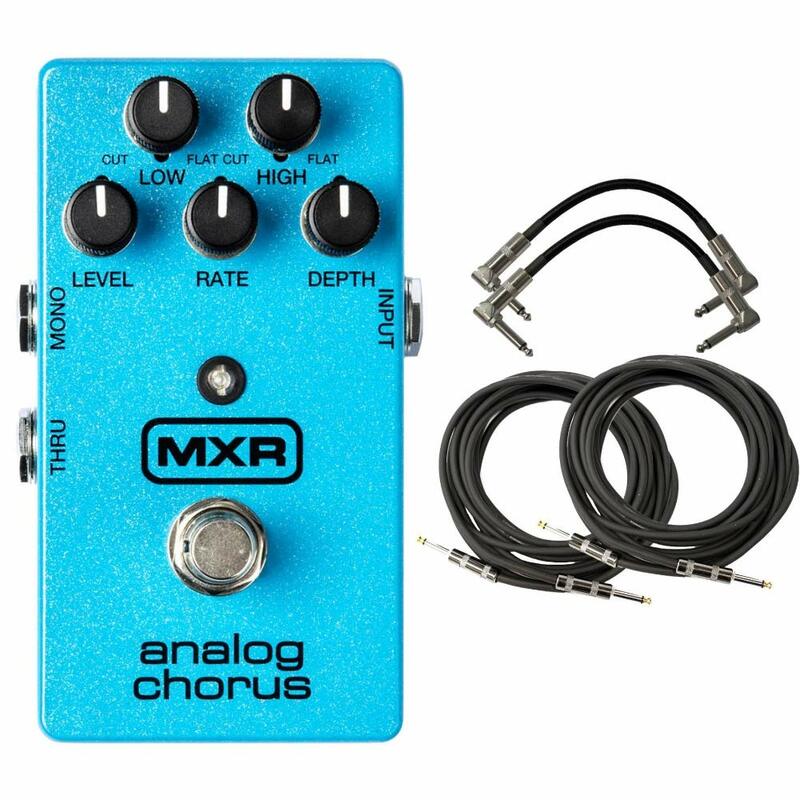 This MXR delivers one of the warmest and reverberant tones out there. It is one of the only systems to use a bucket-brigade circuit. This circuit is where a line of capacitors pass the signal from one to the next on a time-delay. For those doing covers or looking for a more “analog” sound, I feel like the MXR mimics the effects systems of the 70’s and 80’s better than about any other unit out there with its true analog chorus sound. The equalizer knobs give you some additional tonal control not often found in the competition and it enables you to truly customize your sound. Other brands also offer EQ control, but this one seems more accurate than most of the rest. The level knob lets you set how “many” of the “guitars” it has. In other words, it allows you to use more or less of the Chorus effect. It also has the rate knob that controls how fast the chorus modulates. I find this effect to be more subtle, but a little tweaking here can really dial in your sound. Plus the presets are really good, meaning it sounds great right out of the box with no finicking. Even better you don’t get an annoying hiss when you plug it in. The LED is well-lit, making it easy to see if it is on (even for the older geezers). If you are playing on a dark stage, it is a little bright, and you might want to darken it with a black sharpie. This is probably one of the most adjustable chorus pedals out there. You’ll find yourself using it all of the time, even if only on a low-level setting. You can probably tell by now that I am a sucker for that analog tone. This little pedal offers some of the sweetest tones in the industry with some cool technology that really sets this pedal apart. For starters, this is an analog chorus pedal. It has those sweeter tones you would expect, but you can always harden that up with a little distortion. The knobs on it will look very familiar. You have the FX level, which controls the amount of the chorus you mix in. The speed knob is the same as the rate knob on these other units. You can control how quickly it modulates. Turn it up for a full warble. The tone allows you to access either a brighter or warmer sound. What I love about all of these settings is that you can truly hear the difference. On some of these pedals, the difference between the settings is so subtle that you aren’t sure you can tell the difference. This pedal gives you full control and invites you to experiment. It is also a true bypass kit which keeps the pedal from adding any load or hiss to your setup when it is turned off. I also love that it has both stereo and mono input. Most of these pedals only offer a mono input. By offering both, it gives you more options on where in the signal chain you can insert it. Some would argue that you get a more accurate stereo chorus sound with this configuration. Now, this is where most guitar pedals stop. Not TC Electronics. 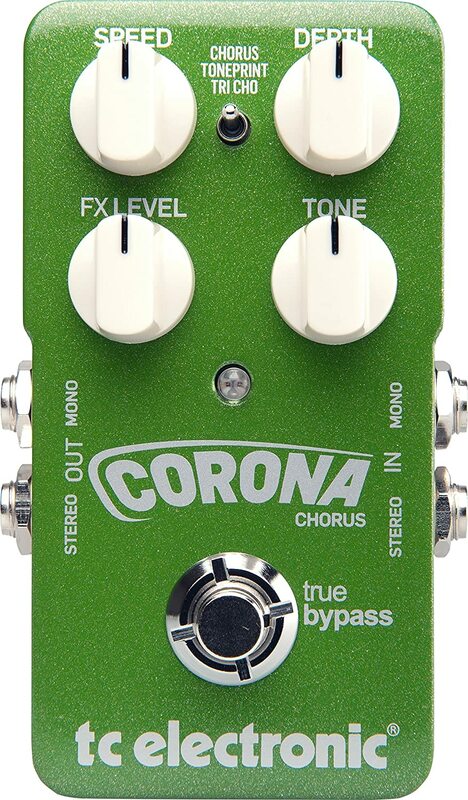 The Corona Chorus offers three chorus settings. You can flip the switch in the middle down to get a triple-chorus effect. the Tri-Chorus is more than you will ever need and you’ll use the Level knob to dial that effect up or down. But they aren’t done. All of the TC Electronics are beginning to use Toneprint. With Toneprint, you can use your laptop to create new effects settings. Or, you can download presets from other famous rockers. It sounds gimmicky, but they are combining the tonal qualities of an analog pedal with the customization you can only find in multi-effects pedals. I think they are onto something. They are vying hard for the top spot with this kit. I’m hard-pressed to think of a situation where this pedal would not be a good choice. Basically, if you don’t see yourself using your phone to connect with the Toneprint app to tweak the settings, then I’d go with the MXR above. 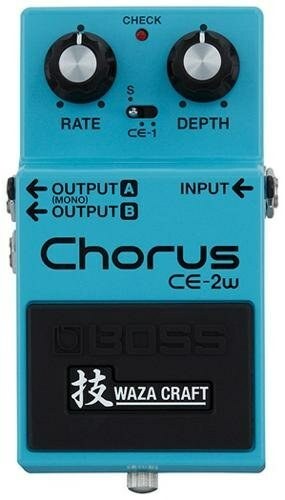 If you want a harsher, digital tone, then I’d go with the Boss CH-1 below. Otherwise, this is one of the best Chorus effect pedals. High-end-stage-quality sound in an affordable pedal. Back in the 1970’s Boss released one of the early Chorus pedals. The CE-2 Was one of those devices and this version of it pays homage to the original pedal. Still made in Japan, this is one of the most reliable brand of guitar equipment you can invest in. We also review the CH-1 on this page and I love that analog sound with the warm sweet tones. This one is the perfect choice for those who want a classic sound. Between your rate knob and your depth knob is a three-position switch. This switch lets you change the modes and type of Chorus effect the pedal generates. In the first position, you have the classic CE-2 sound (with the additional upgrade of stereo output, should you want that). This first position is a little warmer sounding in my opinion. You also get a slightly quicker rate. The middle position gives you the CE-1 Chorus sound. The CE-1 was one of the original vibrato machines on the market, and this pedal brings back the classic bucket-brigade circuitry and sound. 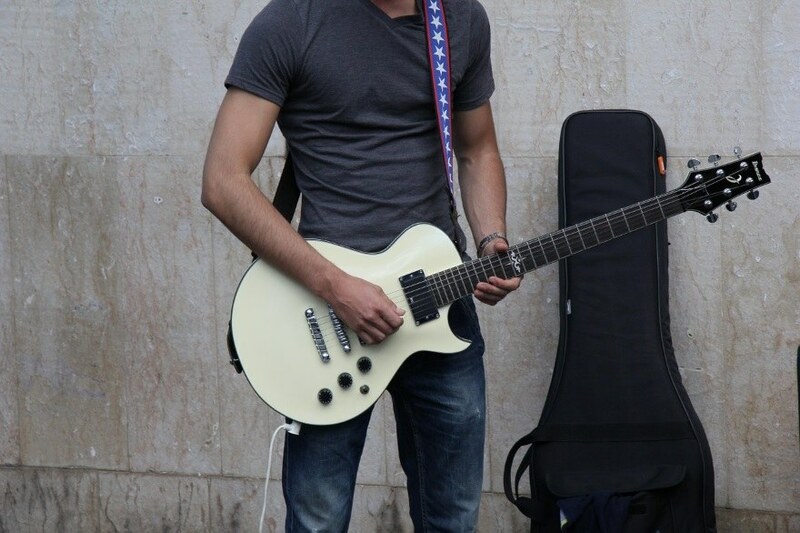 The far right position delivers the vibrato function of the CE-1. This Vibrato setting will have a faster rate, and I feel like it gives a very pleasant chimey tone that makes you want to keep playing. I can see myself over-using this effect. I love the Boss sound and would probably go with the CH-1 over the CE-2 since I’m not big on extremely classic tones. But if you want to recreate some classic tones, this one will bring back all of the happy memories that you’ve been missing. There is a lot going on with this pedal. For the artist who needs more knobs. If knobs don’t scare you, skip my review and just go get this pedal. 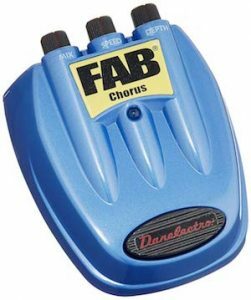 This is also a good choice for all of you who feel that the most Chorus pedals are “not quite right”. With some patience, you can dial in the perfect effect levels. The shape knob allows you to choose the “shape” of the sound. If you can visualize the type of sound waves your playing produces, this knob allows you to control the shape of the effect. This granularity makes this one an incredible option for forging new paths. The Intensity is a lot like the level knob and controls how much of the mix you are bringing in. You can dial this up or down to control how much of the effect you enjoy. Animate is the knob that controls how much the pitch-shifted signal swings. This knob is the real “wild card” that sets this pedal apart and brings it to life. You’ve met the rate and depth knobs on the other devices we review. These work similarly. Dimension controls how much echo your playing gets, which truly puts it into another “dimension”. You don’t get these kinds of echoes on the other setups. By this point, you either are dying to get your hands on this pedal or are running scared of all the knobs. Trust your instincts. The pedal sounds great. If you want endless options, it is one of the best to go with. If you want endless options without some of the complications, the TC Electronics might be more up your alley with its smartphone interface. This is typically the top-ranked pedal. Not only does it offer the Boss name, but it also offers an incredible range of sound. Some have argued that it is actually more versatile than the MXR. It is a favorite for everyone from those doing Korn covers to the rhythm guitarist at our local mega-church who needs to play soft alter calls. While it doesn’t offer a full-on equalizer, it does offers a tone control that allows you to choose between a darker or a brighter sound. The rate knob controls the speed of the modulation, while the depth switch allows you to control how deep the modulation effects are. You have two outputs. If you are running it in the mono setting, both your clean and chorus lines run through the same output. On the stereo outputs, those to sounds are separated, allowing you to run it to two amps for the full stereo effect. Now, this a digital chorus pedal and in my opinion, you can tell the difference in the sound. Where the MXR M234 sounds very “sweet”, this one is more “tinny” and almost gets into flanger territory. This makes it an excellent pedal for running with some distortion. If you want an Analog version, check out the Chorus Ensemble, the Boss CE-5. The all-metal construction is sure to please. I feel like it is a little lighter built than the MXR, but that is a purely subjective opinion. These things hold their resale value like crazy and you can pick them up all over eBay in used condition for near-new prices. So they obviously last forever. 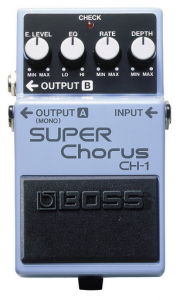 If you are looking for a more versatile unit that isn’t only doing worship music and 80’s covers, the Boss CH-1 should definitely be the one you try. This is a really unique box, and I know it tends to get overlooked a lot. Basically, this box is what Kurt Cobain used. Technically, he used the older Polychorus, but this is the closest thing they make to that classic stomper. 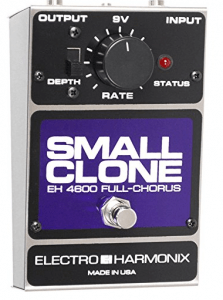 It is an excellent clone and it is really well designed to deliver that classic sound. However, they realized that not everyone wants to sound like Nirvana. So they added an extra range of control in the depth and speed adjustments, and it really gives you the ability to adapt this box to nearly any sound. The other neat aspect is that the Electro-Harmonix really works well for bass guitar. It seems to handle the deeper tones better than about any other unit out there, and the tones you create are absolutely mind-blowing to the audience. If you love the analog sound, you need to look really closely at this one. I mean, I love the MXR, but there is a really good chance that if you like the MXR the warm, classic tones of the Electro-Harmonix will blow you out of this water. I also love how easy it is to find a great tone. So often you have to spend all of your time dodging the bad mixes these pedals put out. On this setup, the bad spots are so few and far between that it just seems to deliver an incredible range of chorus tones no matter where you put it. The only downside is that you do need a power supply with a 1/8″ jack to run this unit. Keep that in mind. This is an excellent bargain pedal for those of you who want to bring some 80’s chorus pedal action into your playing but who don’t want to commit to a top-dollar pedal. This beauty brings a different design to your layout and offers those shimmering chorus tones without breaking the bank. Because of its affordability, it is easy to overlook the D5. However, it really brings so much more clarity to your tones, that it is an excellent addition to every pedal board. If you think your sound is dialed in, try adding this pedal. You’ll be amazed at how much more clarity and life you will get out of your playing. It comes with mix (turn up or down the chorus level), speed and depth controls. So the basics that you are used to on most of these pedals. The pedal itself is big and springy, making it easy to activate even when you are mid song. This is a buffered bypass pedal, which means that it will use electricity anytime a line is plugged into it. For that reason, it doesn’t make sense to use the optional 9V battery power but to plug it into the DC line on your board. The other thing that is going to surprise you is that it is a heavy plastic pedal. It holds up well, but after all of these metal pedals, I wanted you to be aware of that. An excellent, cheap pedal and great for creating those Alice In Chains rock tones. I feel like this pedal doesn’t get the love it deserves. Thanks to the newest in electronics, it is no longer necessary to buy the largest pedals. Sure, some of us still feel like we need bigger pedals as they are more stable. But for those of us who travel frequently, the smaller form-factor is an advantage we should consider. 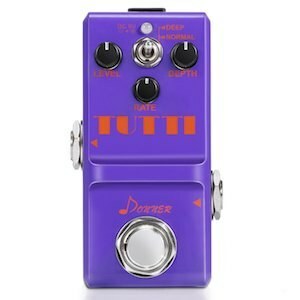 Donner makes one of the smallest chorus pedals on the market. This mini pedal is ideal for any board. you can slip it in even when your board is crowded. The solid metal housing makes it perfect for the rough life of a traveling musician. As with most of the pedals, you get three knobs that control your level, depth, and rate. It is a fully analog pedal and true bypass, with that unmistakable “pop” that happens anytime you turn it on. Of course, you enjoy the benefits of a pedal that doesn’t interfere with the signal when it is turned off. Neither this one or the Danelectric above are going to deliver those soaring sounds that you want for worship music. But they are excellent for adding some fatness for grunge and rock. I’d choose the Danelectric Fab5 above if you have the room for it. Otherwise, this is an excellent addition for those times you need added depth to your tone. The key thing to remember as you shop for pedals is that you are going to need to plan to practice with the pedal. I always encourage musicians who don’t have a lot of experience, to not take on too many pedals at once. You really need to take the time to get decent with each pedal as a stand-alone unit before diving into to mixing and matching. The key thing to remember as you shop for pedals is that you are going to need to plan to practice with the pedal to get accustomed to it. I always encourage musicians who don’t have a lot of experience, to not take on too many different pedals at once. You really need to take the time to get decent with each pedal as a stand-alone unit before diving into to mixing and matching. I’m a big fan of getting a compressor pedal fairly early on as it helps to clean up your tone before you run it through other effects pedals. To a certain degree, the chorus effect sounds similar. A chorus pedal rapidly repeats the note played. There is a little “rate” knob that lets you turn it up for more a more blended sound, or to slow it down for a more exaggerated effect. Some people compare the chorus sound to the delay. However, it tends to be more harmonic thanks to additional pitch modulation where the delay is primarily a repeating of your note. Flanger is another similar sound, but is darker, has a shorter delay, and gives the note more tremolo. It also gets this “whooshing” noise going on that can be really noticeable if you listen to a chorus pedal and a Flanger side by side. However, when a flanger is set at a moderate volume, it can be really hard to tell the difference. I find a well-adjusted pedal to sound quite “shimmery”. for a more shimmery effect. Ethereal, even. In the late 1970’s Boss was the first one to come out with a chorus pedal in stompbox form. The CE-1 was huge and unwieldy… and launched what is not one of the top gear companies. Nirvana is who everyone points to for a great example of the use of chorus in music. But they actually used a flanger to create those sounds. The Police is probably a better example of this style of work in pop music (I like “Walking On The Moon” if you want to hear the effect. The Pretenders “Brass in Pocket” is another great one with the subtle use in the background). 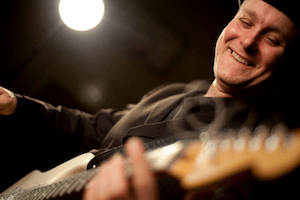 So you can see that even when playing in a full band, it can be a great way to add some depth to a certain element of the song, whether that be the rhythm or a solo piece.